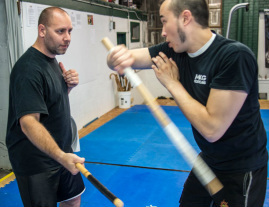 Kali is an ancient word that serves as an umbrella term for all the Filipino martial arts. The word itself translates as the study of "Body Motion." Although the base of the system is in weaponry, its empty hand systems feature some of the most sophisticated techniques and training methods in existence. The weaponry training covers a wide spectrum featuring blunt weapons, bladed weapons, flexible weapons and weapons of opportunity. Kali is known for it's very sophisticated reflex and flow drills, which are taught in a logical progression, allowing the practitioner to learn quickly. Movements are broken down into easily learned segments. You will learn to perform techniques such as counters, disarms, sweeps and locks in flow. This art is both physically and intellectually challenging. Personal exploration, discovery, coordination, balance, self defense, health and fitness are just a few of the benefits of this beautiful art. Once you start training it, you will see why many people view Kali as more than a martial art ; it's a way of life! Check out the video below to learn more about the amazing benefits of training Kali!